Mixed Media has recaptured my heart this year, with stencils, illustration, medium and above all color! The freedom it gives me to create texture and colors gives me the greatest satisfaction. Today’s tutorial and project was a true experience. 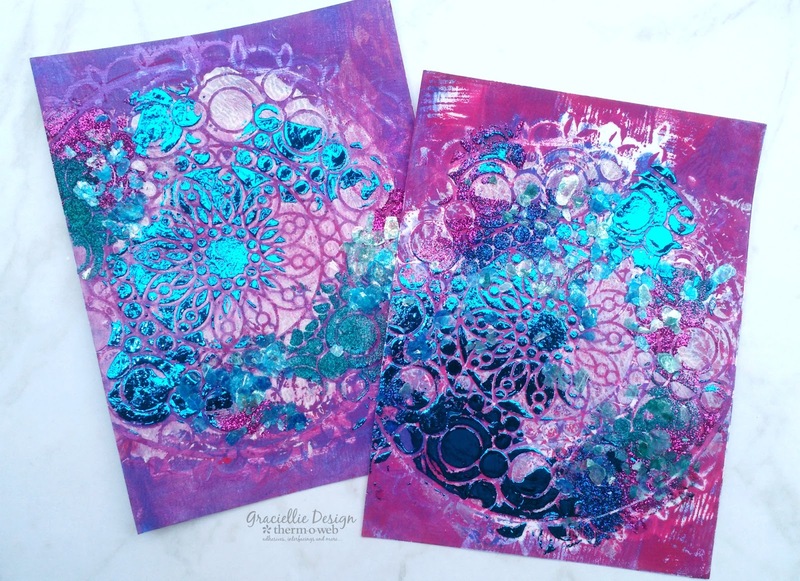 I will be sharing with you how to monoprint a background with paint, Deco Foil and other textures. I have a gelli plate that had not seen the light of day in ages and I decided to take it out to try out some monoprinting (which is a tremendously addictive process). 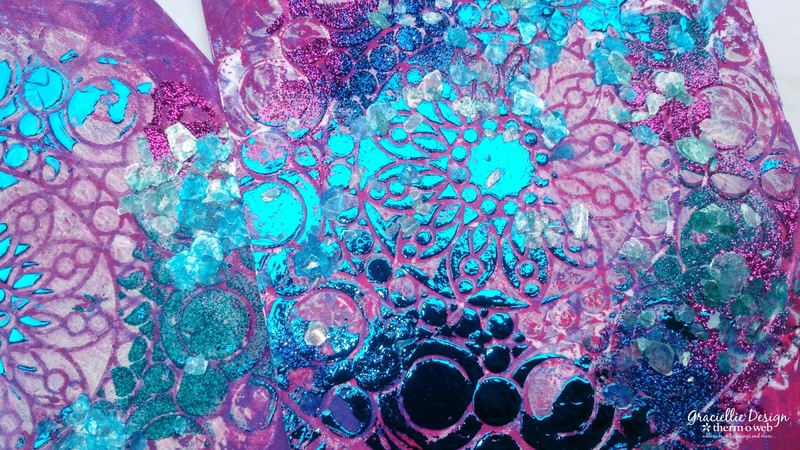 The idea of monoprinting with foil had been wandering in my head for at least almost 2 years but of course monoprinting directly with Deco Foil or Deco Foil Mediums would most likely ruin the gelli plate… So I came up with a trick that allowed me to add that foil monoprinted look easily! The backgrounds turned out so incredibly textured and colorful I had to finish them off as cards with one of my digital stamp sentiments from my shop (Always Remember stamp set). But that is all I’m going to say because it’s time to head over to Therm O Web to view the details on this tutorial! 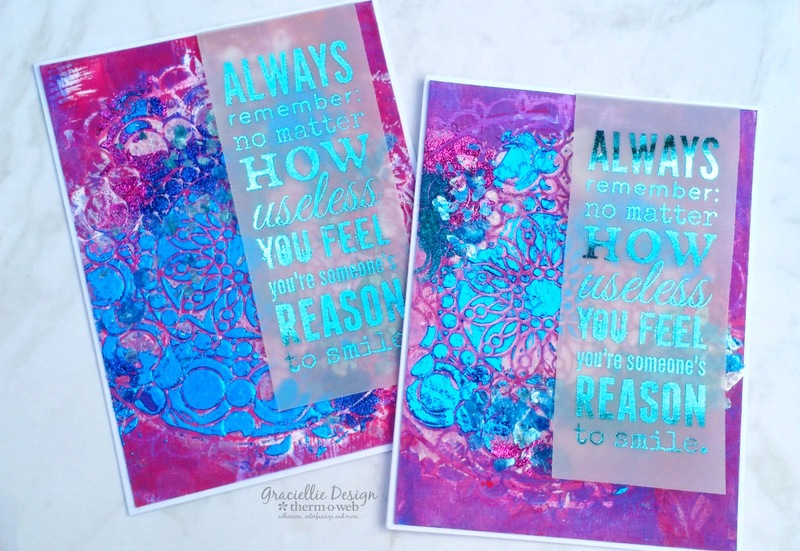 Click here to see the complete supply list and step by step tutorial on these Foil Monoprinted Backgrounds. Leave me a comment and tell me… Do you like this technique and would you try it out? Now see you on Therm O Web for the full tutorial post! Thanks for stopping by! Beautiful project and phrase! Thank you for sharing it with us at MMW. 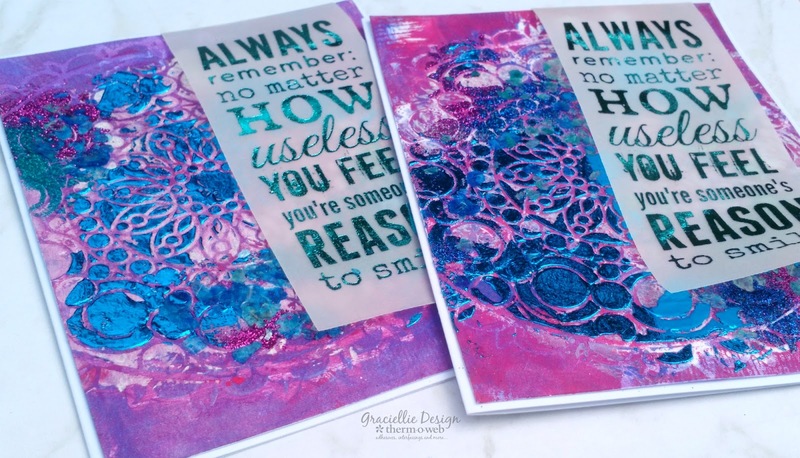 I absolutely love this monoprinting technique Graciellie! Love the bold colors! Thank you for playing along with us over Simon Says Stamp Monday Challenge! We hope to see you again next week!